In an ideal world, there would be infinite computing resources. These resources would be free and sustainable, with no impact on the future of our planet. They would run services that would be accessible anytime and everywhere with zero latency and 100 percent uptime. In this vision of the ideal, we all would be able to protect the confidentiality of the data against the strongest possible attacks. These resources would support a variety of best-of-breed devices to meet every application and situation. Using these resources would be seamless and available to every person and organization on the planet. Alas, we do not live in an ideal world and never will, though we are making progress. The cloud has created an environment of abundant computational resources. The edge has helped reduce latency and given us options to implement different security models. Mixed reality technology is making the integration of modern information technology into the real world more seamless. Under the covers, we are leveraging AI, algorithms, network technology, data management systems, and a variety of software engineering and program methodologies to continuously improve the overall system and make it ever-more adaptive. 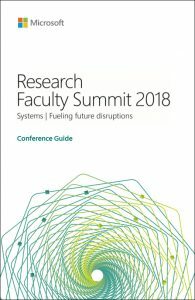 The Research Faculty Summit 2018 will bring together leaders and researchers from the broad systems research area in computer science. The summit will present the latest information and results from Microsoft product and research groups. 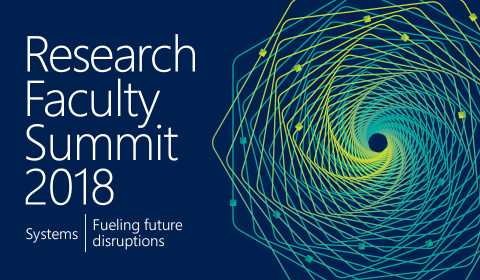 Faculty Summit attendees will have a front row seat to hear, share and discuss the current state of the art, issues, and ideas so that we can all push together to move the frontier toward an ideal world of computing. As systems become increasingly complicated, cater to large geographical areas, have to seamlessly utilize an incredibly diverse array of computational resources and serve real-time, safety and mission-critical applications there is an emerging need for them to be self-aware or self-tuning in nature. Advances in machine learning and artificial intelligence have recently led to algorithms which can learn high-performance policies over extremely large state spaces (e.g. solving games like Ms. Pacman, Go, Poker or learn self-driving policies for autonomous cars, drones, etc). Just as the growth of cheap abundant computing and specialized systems (e.g. dedicated accelerators for deep learning) has led to rapid advances in machine learning and artificial intelligence, there is an emerging opportunity for machine learning to help systems back. In this session, we want to explore the technical opportunities and unique challenges that surface when applying machine learning to optimize large-scale distributed systems. Specifically, we want to explore challenges in developing systems which are self-tunable, resource-aware and use machine learning to dynamically optimize a running system to achieve desired latency, throughput, and other system-dependent utility functions. Making significant progress in this area requires multiple disciplines coming together, namely: machine learning, decision-making, distributed systems, and optimization. This talk presents Wolong, a backend optimization system for accelerating deep learning computation on graphics processing units (GPUs). It automatically applies operator batching and kernel fusion to avoid system overhead such as scheduling and kernel launch by analyzing the dataflow graph. This optimization is transparent to the AI model developer and, by integrating with TensorFlow, it can accelerate deep learning computation rates by an order of magnitude. Open Platform for AI (Open PAI) is an open source platform for graphics processing unit (GPU) cluster management and resource scheduling. The platform’s design has been proven in Microsoft’s large-scale production environment. Today, many of the technical products and services we use are created by one largely homogeneous group of people: men. That doesn’t make today’s technology bad or unhelpful. However, it does mean our society is missing out on other perspectives. Considering how much technology drives our economy and our lives, it makes sense to consider this question: “What if women, and all groups underrepresented in computing, were at the technology design and research table alongside white males?” Research tells us we would both solve different problems and solve problems differently. This panel of computing innovators will explore the possibility for exciting outcomes if more perspectives were at the table. Confidential computing allows users to upload encrypted code and data to the cloud and get encrypted results back with guaranteed privacy. Confidential computing means cloud providers can’t see customers’ secrets even if cloud administrators are malicious or hackers have exploited kernel bugs in hosts. This session discusses research on confidential computing, including secure hardware containers, operating systems, compilers for secure code generation, cryptography, and redesigning cloud services. This session will provide academic researchers the opportunity to discuss their work in this space and Microsoft practitioners to describe the current state of continuous deployment practices within Microsoft product groups. This discussion will describe the practical issues encountered by deploying software for different classes of products, such as understanding customer acceptance of continually changing interfaces. The speakers will also describe the future directions and challenges that they foresee from both a technical and engineering perspective and the transformative role AI can play in continuous deployment. In the quest for higher performance, modern CPUs make heavy use of speculative execution. Unfortunately, speculative execution opens the possibility of side-channel attacks in which malicious parties can read the memory of co-located processes, OSes, and VMs (e.g., Meltdown, Spectre). Similarly, in the quest for higher memory capacities, modern DRAMs have drastically increased the density of memory cells on a chip. This high cell density opens the possibility of attacks that cause bit flips in DRAM (e.g., Rowhammer). A single bit flip is sufficient to lead to serious security breaches, such as privilege escalation, remote login, or factoring an RSA private key. Unfortunately, no single silver bullet for stopping these types of attacks exists. These attacks all stem from hardware “bugs.” While fixing each particular bug is feasible, the hardware life-cycle is very long, and the fixes often come with serious performance and cost overheads. Software-based fixes offer a faster response, but also may impose significant overhead. The goal of this session is to discuss the state of the art techniques in performing such attacks and defending against them using both hardware and software. Blockchains are an emerging technology that promises to transform contracts and transactions between mutually untrusted entities. The goal of this session is to explore current trends in blockchain systems with a set of presentations focusing on performance and security of blockchain systems and on connections between blockchains and traditional database systems. Increasing availability of the data, coupled with breakthroughs in Machine Learning and AI, have raised the ambitions of the enterprises to exploit insights from data to transform their businesses. This has challenged the data platform builders to architect platforms that support the exploration of insights in an efficient and cost-effective manner. Conversely, it has raised the hopes of data platform architects that the telemetry data captured by the data platforms can be harnessed bring the data-driven innovation to customize data platforms and make them adapt to the workload and data characteristics. In this session, we will explore this duality of “Data Platforms for AI” and “AI for Data Platforms”. DataMap is the underlying technology platform that powers much of Microsoft’s technology stack for complying with privacy legislation worldwide, including with the European Union’s General Data Protection Regulation (GDPR). It grew out of a Microsoft Research project published at the IEEE Symposium on Security and Privacy. This talk chronicles key moments and insights from DataMap’s journey from a research project to a production system. What is the media of the future – glass and/or DNA? How do we push for more performance at lower storage costs? What does tiering look like in the cloud era? Cloud storage leaders will answer these questions and many more while sharing their visions, views, and insights. Emerging networked systems, e.g., distributed storage and machine learning platforms, demand high-performance networking. Advanced networking hardware, including optical switches, programmable switches, RDMA NICs and smart NICs can answer this need. However, extracting the required step change in performance and functionality poses many challenges and will necessitate further hardware innovation. Hardware innovations in isolation, however, are not sufficient–they enable yet also require new architectures for the network and for applications. For example, new ultra-fast optical switching technologies will likely necessitate a step away from the traditional packet-switched network model. More flexible programs on switches will require new management frameworks. Even commodity hardware such as RDMA over Ethernet creates new problems such as congestion spreading and deadlocks. 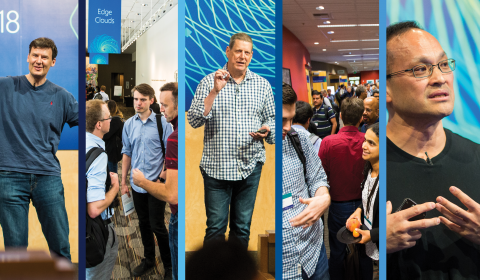 This session will bring together thought leaders in Microsoft and in academia to rethink how we co-design networked systems and applications with advanced networking hardware to fuel the cloud of the future. Edge computing is a natural evolution of cloud computing, where server resources, ranging from a credit-card size computers to micro data centers, are placed closer to data and information generation sources. Application and system developers use these resources to enable a new class of latency- and bandwidth-sensitive applications that are not realizable with current mega-scale cloud computing architectures. Industries, ranging from manufacturing to healthcare, are eager to develop real-time control systems that use machine learning and artificial intelligence to improve efficiencies and reduce cost and the Intelligent Edge is in the center of it all. In this session, we will explore this new computing paradigm by discussing emerging challenges, technologies, and future business impact. The massive scale of cloud infrastructure services enables, and often necessitates, vertical co-design by cloud providers and other vendors of the infrastructure stack. Unlike the traditional model where different vendors built different layers of the stack with generic interfaces, cloud infrastructure providers often control the entire stack, which provides the ability for different companies to co-design. Software-defined networking is an example of a co-design that has resulted in significant efficiency. However, most efforts at co-design have been massive engineering efforts involving ground-up rebuilding of the system—a not very efficient process. Micro co-design is a MInimally invasive, Cheap, and retRO-fittable approach to co-design that extracts efficiency out of existing software infrastructure layers. It does this by making lightweight changes to generic software interfaces. This talk will describe multiple systems we have built with this approach in the space of big data analytics and deep learning infrastructure, demonstrating efficiency and functionality improvements that are both pragmatic and low-cost. A new generation of programmable hardware in the data center, (e.g., FPGAs, programmable dataplane switches, and smart NICs) provide reconfigurable processing capabilities that are exposed to systems designers. Many of these components come from the networking world, where they are applied to traditional-packet processing tasks. In this session, we ask whether they can be applied to distributed systems in order to achieve higher performance and reliability. The key to this approach is looking at the entire stack in order to co-design systems and hardware. We will look at several recent systems that apply this approach to different application domains and underlying hardware platforms. Traditional technology scaling trends have slowed, motivating many to proclaim the end of Moore’s law and the end of CMOS process technology. Instead of a cataclysmic end to computer systems as we know them, an evolution of new technologies is about to happen. One such technology is quantum computing, which holds the promise to solve classically intractable problems – ones that are completely out of the realm of today’s classical computing capabilities. Until recently, quantum computing has been a field that has only been accessible to physicists and mathematicians. Pioneering work in the quantum field is accessible to software developers and classical computer architects who are looking to develop full-scale quantum systems. This session will cover some of the methodologies, tools, and architectures that will be required to build, deploy and use a quantum computer. These full stack solutions cover quantum algorithm development, software tools, classical computer architecture and the quantum plane. The quantum plane in particular poses challenges that are very different from today’s classical computers. We are witnessing a huge surge in efforts and interest in developing machine-learning (ML) based solutions for optimizing large-scale networked systems. With the unprecedented availability of data and computing power, the early evidence on using ML for systems has been promising. Microsoft has been at the forefront of applying data at massive scales to address pressing issues in large-scale systems. At the same time, there is a growing voice in the systems and networking community for more “principled” solutions. They are concerned that building solutions we don’t fully understand will ultimately come back to bite us. This session intends to wade into this storm! What are the networked systems problems for which ML-based techniques are appropriate? Does the fact that the network is often a black box, with much uncertainty with regard to its state, make ML more or less appropriate for networked system than for systems in general? What is the right mix of ML and traditional modeling and algorithms? Do we really need a full understanding of solutions as the “traditionalists” insist? Leading researchers in the field will discuss how cutting-edge ML advances can be applied to networked systems and lay out principles for ML-based networking and systems research in the coming years. Bugs in security-critical system software already cost society billions of dollars, and the need for secure software is increasing as more devices are connected to the Internet. This session will outline the security needs of network-connected systems and explore how formal verification can help secure them. We’ll present research on bringing high-value security to low-cost devices, particularly those powered by microcontrollers – a class of devices ill-prepared for the security challenges of Internet connectivity. We’ll also discuss advances in verification tools and techniques that lead to real, usable verified software, with an emphasis on critical systems such as distributed and operating systems, cloud infrastructure, networking protocols and cryptography. Finally, we’ll present an overview of the Azure Sphere product as part of Microsoft’s efforts to secure MCU-based devices. Chap Alex is a principal group engineering manager at Bing, Microsoft. He has earned an MS degree in computer science from the University of Montana, and a BS degree in aeronautical engineering from Rensselaer Polytechnic Institute. Tom Anderson is the Warren Francis and Wilma Kolm Bradley Endowed Chair in the Paul G. Allen School for Computer Science and Engineering at the University of Washington. His research interests span all aspects of building practical, robust, and efficient computer systems, including distributed systems, operating systems, computer networks, multiprocessors, and security. He is a member of the National Academy of Engineering and the American Academy of Arts and Sciences, as well as winner of the USENIX Lifetime Achievement Award, the USENIX Association STUG Award, the IEEE Koji Kobayashi Computer and Communications Award, The Mark Weiser Award (ACM SIGOPS), and The IEEE Communications Society William R. Bennett Prize. He is also an ACM Fellow, past program chair of SIGCOMM and SOSP, and he has co-authored twenty-one award papers and the widely used textbook Operating Systems: Principles and Practice. Behnaz Arzani is a post doctoral researcher at Microsoft Research in the Mobility and Networking group. She got her PhD in computer science from the University of Pennsylvania in 2017 working with advisors Professor Boon Thau Loo and Professor Roch Guerin. Arzani completed her dual masters degree in computer science and electrical engineering at the University of Pennsylvania in the same year. She completed her BSc in Electrical Engineering at Sharif University of Technololgy in 2010 where she worked with Professor Javad Salehi. Victor Bahl is the director of Mobility and Networking Research at Microsoft, helping shape Microsoft’s long-term strategy through research, industry partnerships, and associated policy engagement with governments and research institutions around the world. 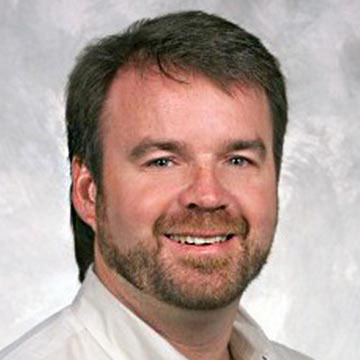 Bahl’s research interests include video analytics, edge computing, mobile computing, wireless systems, cloud services, and data center networking and management. Over his career, he has built a number of seminal, highly cited systems, published in top conferences and journals, authored or co-authored more than 150 patents, given more than four dozen keynotes, received several prestigious awards and honors, and engaged in significant professional and company-wide leadership activities. Jennifer Beckmann is a principal engineering manager for the Microsoft Office Experimentation team. Her team is responsible for the programming interface and development lifecycle surrounding the rich set of feature flags within Office’s client and online versions. Prior to joining Office, she was a principal program manager on the Microsoft Experimentation team where she helped guide and develop the Experimentation services that run hundreds of experiments every day across a variety of products. Beckmann earned her PhD in database systems from the University of Wisconsin-Madison and early in her career she was a developer on the SQL Server team. Carsten Binnig is a professor of computer science at Technische Universität Darmstadt and an adjunct professor of computer science at Brown University. Binnig received his PhD from the University of Heidelberg, and was a postdoctoral researcher in the Systems Group at ETH Zürich and an architect at SAP, working on the in-memory database SAP HANA. His current research interest is on the intersection of systems and AI/ML, including novel approaches for trusted data sharing using blockchains (see http://binnig.name for more details). Binnig has been awarded a Google Faculty Research Award and received several prizes, including best demonstration awards at VLDB and SIGMOD and a best paper award at IEEE Big Data. Daniel J. Blumenthal received his PhD from the University of Colorado Boulder, his MSEE from Columbia University, and his BSEE from the University of Rochester. He is currently a professor in the department of ECE at UC Santa Barbara, Director of the Terabit Optical Ethernet Center, and he heads the Optical Communications and Photonics Integration group. Blumenthal is co-founder of Packet Photonics and Calient Networks. He holds 22 patents, has published more than 410 papers in the areas of optical communications, optical networks and packet switching, optical gyro sensors, photonic integration in InP, SiPh/InP and ultra-low loss waveguide platforms, and silicon photonic and nanophotonic device technologies and is co-author of Tuneable Laser Diodes and Related Optical Sources. Blumenthal is a 2017 Fellow of the National Academy of Inventors, an IEEE Fellow, and Optical Society of America Fellow. He has served on the board of directors for National LambdaRail and as an elected member of the Internet2 Architecture and Operations Advisory Council. He is recipient of a Presidential Early Career Award for Scientists and Engineers (PECASE), an NSF Young Investigator grant, an Office of Naval Research Young Investigator Program award, and has served on numerous program committees including OFC, Photonics in Switching, and as general editor of multiple IEEE journals, including the 2018 JSTQE special issue on Ultra-Low Loss Planar Silicon Nitride Waveguides and Their Applications. Sandy Blyth is the global managing director of Microsoft Research’s Outreach. In this role, Sandy drives strategy and execution for Microsoft Research’s engagement with the external research community. Outreach amplifies the impact of research at Microsoft by generating awareness of and interest in our world-class research, creating and supporting collaboration opportunities between Microsoft and external researchers, investing resources in high-potential and high-impact research projects on behalf of the company, and helping to attract and develop great diverse research talent. Sandy began his career at Microsoft in 2003 in the M&A organization, responsible for due diligence, planning, and leadership of acquisitions, joint-ventures, and divestitures for Microsoft. Prior to joining Microsoft’s research efforts, in addition to working in M&A he ran the worldwide sales excellence function for the Communications Sector, and was on the leadership team of the Worldwide Enterprise and Partner Group (WW EPG). Before joining Microsoft, Sandy held a number of senior positions in the technology industry, including at IBM, AT&T, and Cambridge Technology Partners. Sandy received his B.A. in Political Science with honors from the University of Washington. He lives in Sammamish with his wife and two daughters. Dan Bohus works on developing multimodal, integrative-AI systems for physically situated interaction and collaboration between people and machines. The long-term question that shapes his research agenda is: how can we enable interactive systems to reason more deeply about their surroundings and seamlessly participate in open-world, multiparty dialog and collaboration with people? Physically situated interaction hinges critically on the ability to reason about and model processes like conversational engagement, turn-taking, grounding, interaction planning, and action coordination. Creating robust solutions that operate in the real-world brings to the fore broader AI challenges. Example questions include issues of representation, machine learning methods for multimodal inference from streaming sensory data, predictive modeling, decision making, and planning under uncertainty and temporal constraints. Doug Carmean is currently the lead architect of the Microsoft Quantum Project, where he is working to define the future of computing and storage. His group is using the fundamental building blocks of nature to build quantum computers and DNA-based information storage that will revolutionize computing. In a previous life, Carmean was an Intel Fellow and director of the Efficient Computing Lab there. He is responsible for creating the vision and concept for the Xeon Phi family of products, an architecture for highly parallel workloads including high performance scientific applications based on Intel Architecture processors. Carmean holds more than 25 patents, and many pending, in processor architecture and implementation, memory subsystems, and low-power design. He has published more than a dozen technical papers. Luis Ceze is a professor in the Paul G. Allen Center for Computer Science and Engineering at the University of Washington and a venture partner at the Madrona Venture Group. His research focuses on the intersection between computer architecture, programming languages, machine learning, and biology. His current focus is on approximate computing for efficient machine learning and DNA-based data storage. He has co-authored more than 100 papers in these areas and has had several papers selected as IEEE Micro Top Picks and CACM Research Highlights. His research has been featured prominently in the media, including New York Times, Popular Science, MIT Technology Review, Wall Street Journal, among others. He is a recipient of an NSF CAREER award, a Sloan Research Fellowship, a Microsoft Research Faculty Fellowship, the IEEE TCCA Young Computer Architect Award, and the UIUC Distinguished Alumni Award. He consults for Microsoft and is a member of the DARPA ISAT and MEC study groups. Ranveer Chandra is a principal researcher at Microsoft Research, where he is leading FarmBeats, an incubator project to use IoT in agriculture. His research has shipped as part of multiple Microsoft products. He is active in the networking and systems research community; and has served as the program committee chair of IEEE DySPAN 2012 and ACM MobiCom 2013. Chandra is also leading a battery research project and the white space networking project at Microsoft Research. As part of his doctoral dissertation, Chandra developed VirtualWiFi, which has been downloaded more than 750,000 times, and is among the top 5 downloaded software products released by Microsoft Research. Chandra has published more than 80 papers; and filed over 100 patents, more than 85 of which have been granted by the United States Patent and Trademark Office. His research has been cited by the popular press, such as The Economist, MIT Technology Review, BBC, Scientific American, New York Times, and WSJ. He has won several awards, including best paper awards at ACM CoNext 2008, ACM SIGCOMM 2009, IEEE RTSS 2014, USENIX ATC 2015, and Runtime Verification 2016. He has also received numerous recognitions, including the Microsoft Research Graduate Fellowship, the Microsoft Gold Star Award, MIT Technology Review’s Top Innovators Under 35, TR35, and Fellow in Communications, World Technology Network. Chandra has an undergraduate degree from Indian Institute of Technology Kharagpur, India and a PhD from Cornell University. Surajit Chaudhuri is a distinguished scientist at Microsoft Research and leads the data management, exploration, and mining group. He also works closely with Microsoft’s Azure Data division. Chaudhuri’s current areas of interest are big data platforms, self-manageability, and cloud database services. Working with his colleagues in Microsoft Research, he helped incorporate the Database Engine Tuning Advisor and Data Cleaning technology in Microsoft SQL Server. Chaudhuri is an ACM Fellow, a recipient of the ACM SIGMOD Edgar F. Codd Innovations Award, ACM SIGMOD Contributions Award, a VLDB 10-year Best Paper Award, and an IEEE Data Engineering Influential Paper award. Mung Chiang is the John A. Edwardson Dean of the College of Engineering and the Roscoe H. George Professor of Electrical and Computer Engineering at Purdue University. Previously he was the Arthur LeGrand Doty Professor of Electrical Engineering at Princeton University, where he also served as Director of Keller Center for Innovations in Engineering Education and the inaugural Chairman of Princeton Entrepreneurship Council. His research on networking received the 2013 Alan T. Waterman Award, the highest honor to US young scientists and engineers. His textbook “Networked Life,” popular science book “The Power of Networks,” and online courses reached over 250,000 students since 2012. He founded the Princeton EDGE Lab in 2009, which bridges the theory-practice gap in edge networking research by spanning from proofs to prototypes. He also co-founded a few startup companies in mobile data, IoT and AI, and co-founded the global nonprofit Open Fog Consortium. Adam Chlipala has been on the faculty in computer science at MIT since 2011. He did his undergraduate work at Carnegie Mellon and his PhD at Berkeley, and his research focuses on clean-slate redesign of computer-systems infrastructure, typically taking advantage of machine-checked proofs of functional correctness. Much of his work uses the Coq proof assistant, about which he has written a popular book, Certified Programming with Dependent Types. His work includes finding opportunities for drastic simplification over incumbent abstractions in computer systems, through the use of object-capability systems, transactions, proof-carrying code, and high-level languages with whole-program optimizing compilers. Some recent projects include Fiat Cryptography, for proof-producing generation of low-level cryptographic code, today run by Chrome for most HTTPS connections; and Ur/Web, a production-quality domain-specific language for Web applications. Debadeepta Dey is a researcher in the adaptive systems and interaction group led by Eric Horvitz at Microsoft Research, Redmond. Dey received his PhD from the Robotics Institute at Carnegie Mellon University, where he did fundamental and applied research in machine learning, control, and computer vision with applications to autonomous agents and robotics. He received his BEE from Delhi College of Engineering, and prior to joining Microsoft, was a researcher at the Carnegie Mellon University Field Robotics Center. Recent projects include working to bridge the gap between perception and planning for autonomous ground and aerial vehicles. Particular areas of interest include decision-making under uncertainty, reinforcement learning, artificial intelligence, and machine learning. Srini Devadas is the Webster Professor of EECS at MIT. His current research interests are in computer security, computer architecture, and applied cryptography. Devadas received the 2017 IEEE W. Wallace McDowell Award and the 2018 IEEE Charles A. Desoer Technical Achievement Award for his research in secure hardware. He is the author of Programming for the Puzzled, a book that builds a bridge between the recreational world of algorithmic puzzles and the pragmatic world of computer programming, teaching readers to program while solving puzzles. Devadas is a MacVicar Faculty Fellow, and is a recipient of the Everett Moore Baker Memorial Award and the Bose Award for Excellence in Teaching, considered MIT’s highest teaching honors. Christopher Ertl is a security engineer at the Microsoft Security Response Center (MSRC) in the UK. Christopher is focused on finding and exploiting vulnerabilities at Microsoft, and using the information from this research to drive security efforts. Prior to working at Microsoft, Christopher has been an active researcher in the PS4 and iOS fields. Abolade Gbadegesin has more than 20 years of experience in the software industry. As a distinguished engineer in the Windows Core Development group, he works on the foundations of Windows and on the future of Windows-powered experiences across devices and the cloud. His work spans fundamental investments in how Windows itself is built and layered; new capabilities including cross-device and cross-platform functionality; and new form factors and user interaction paradigms. Prior to his current role in Windows Core, Gbadegesin helped to build the Windows Phone product; worked on the Windows Live Storage backend for OneDrive; led the design of the cloud services for Live Mesh; and oversaw the first major overhaul of the core networking technologies for Windows. He holds a BA in computer science from Harvard University. 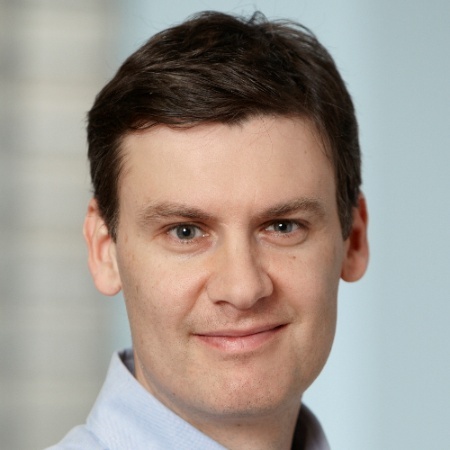 Geoff Gordon is the Research Director for the Microsoft Research Montréal lab, and a professor in the Machine Learning Department at Carnegie Mellon University. He has also served as interim Department Head and as Associate Department Head for Education for the Machine Learning Department. Gordon’s research has focused on artificially intelligent systems that are capable of long-term thinking, such as reasoning ahead to solve a problem, planning a sequence of actions, or inferring unseen properties from observations. Particularly, he looks at how to combine machine learning with these long-term thinking tasks. Gordon received his BA in computer science from Cornell University, and his PhD in computer science from Carnegie Mellon University. His research interests include artificial intelligence, statistical machine learning, educational data, game theory, multi-robot systems, and planning in probabilistic, adversarial, and general-sum domains. His previous appointments include visiting professor at the Stanford computer science department and principal scientist at Burning Glass Technologies in San Diego. Saikat Guha is a researcher at Microsoft Research in India. He is broadly interested in systems approaches to improving privacy. His recent projects are focused on safeguarding user privacy in a way that does not disrupt the emerging business models behind the cloud, online social networks, and mobile ecosystems. Guha received his PhD and BS from Cornell University. He co-authored the RFC that now serves as the best-practice for building TCP support in Network Address Translation (NATs) and firewalls. In 2012, he was named one of MIT Technology Review’s TR35 (35 young innovators under the age of 35) for his work in privacy-preserving systems. Albert Greenberg is Corporate Vice President of Azure Networking. He leads research and development efforts for the Azure Networking team, which is the team that imagines, engineers, and runs the network for Microsoft Cloud. Prior to joining Microsoft, Greenberg worked at Bell Labs and AT&T Labs. He helped to build the systems and tools that run AT&T’s networks and pioneered the architecture and systems at the foundations of software-defined networking. Greenberg joined Microsoft Research in 2007 and moved to Microsoft Azure in 2010. He received his BA from Dartmouth College, and his MS and PhD in computer science from the University of Washington. Greenberg is a State of Washington Academy of Engineering ACM Fellow, and has received the IEEE Koji Kobayashi Computers and Communications Award, ACM SIGCOMM Award, University of Washington Computer Science and Engineering Alumni Award, ACM SIGCOMM and Sigmetrics Test of Time Paper Award. Greenberg has published widely, and his work is built into the core networking curriculum at major universities. Torsten Hoefler is an associate professor of computer science at ETH Zürich. Before joining ETH, he led the performance modeling and simulation efforts of parallel petascale applications for the NSF-funded Blue Waters project at NCSA/UIUC. He is also a key member of the Message Passing Interface Forum where he chairs the “Collective Operations and Topologies” working group. Hoefler won best paper awards at the ACM/IEEE Supercomputing Conference SC10, SC13, SC14, EuroMPI ’13, HPDC ’15, HPDC ’16, IPDPS ’15, and other conferences. He has published numerous peer-reviewed scientific conference and journal articles, and authored chapters of the MPI-2.2 and MPI-3.0 standards. He received the ETH Zürich Latsis Prize, as well as an ERC Starting grant, in 2015. His research interests revolve around the central topic of performance-centric system design and include scalable networks, parallel programming techniques, and performance modeling. Michael I. Jordan is the Pehong Chen Distinguished Professor in the department of electrical engineering and computer science and the department of statistics at the University of California, Berkeley. His research interests bridge the computational, statistical, cognitive, and biological sciences. Jordan is a member of the National Academy of Sciences and a member of the National Academy of Engineering. He has been named a Neyman Visiting Assistant Professor and a Medallion Lecturer by the Institute of Mathematical Statistics. He received the IJCAI Award for Research Excellence in 2016, the David E. Rumelhart Prize in 2015, and the ACM-AAAI Allen Newell Award in 2009. Donald Kossmann is the director of the Microsoft Research Lab in Redmond, which does research in the whole spectrum from fundamental, basic research to technology transfer. Kossmann’s research focuses on data management in the cloud, with the goal to make data in the cloud cheaper, more valuable, and more secure. He is involved with the Cipherbase project, which explores confidentiality and integrity of database systems against insider attacks; and is developing new database system architectures that improve the availability, performance, and cost of a database system in the cloud. Kossmann was a professor in the systems group of the Department of Computer Science at ETH Zurich for 13 years. He was chair of ACM SIGMOD from 2013 to 2017 and served on the Board of Trustees of the VLDB Endowment from 2005 to 2011. He co-founded four companies, including28msec Inc., and Teralytics AG. Tim Kraska is an associate professor of electrical engineering and computer science in MIT’s Computer Science and Artificial Intelligence Laboratory. Currently, his research focuses on building systems for machine learning and using machine learning for systems. Before joining MIT, Kraska was an assistant professor at Brown, spent time at Google Research, and was a Postdoc in the AMPLab at UC Berkeley after he got his PhD from ETH Zürich. Kraska is a 2017 Sloan Research Fellow in computer science, received the VMware Systems Research Award, an NSF CAREER award, an Air Force Young Investigator award, two Very Large Data Bases (VLDB) conference best-demo awards, and a best-paper award from the IEEE International Conference on Data Engineering (ICDE). David Ku is Corporate Vice President for the AI Core group at Microsoft; and responsible for horizontal AI capabilities that power products such as Bing, Cortana, Office, and Azure. Ku also serves as the Chief Technology Officer for the Artificial Intelligence and Research division. Ku joined Microsoft in 2010, where he was responsible for the advertising marketplaces and platforms across search and display. Prior to joining Microsoft, Ku was the Senior Vice President of Advertising Products at Yahoo!, responsible for all advertising products and technology across search and display, video, and mobile advertising. Ku spearheaded the development of Yahoo!’s display and search advertising platforms and was in the core team driving the build-out and acquisition of Web search and advertising capabilities across Yahoo!. Prior to Yahoo!, Ku worked in the electronic design automation industry in various technical and leadership roles. He received a doctorate and master’s in Electrical Engineering from Stanford University. Ku is an advocate and mentor to next generation of tech leaders; the Microsoft sponsor for Stanford University; an active supporter of Asian high-tech communities; and a previous board member for Huan Yuan Science and Technology Association, connecting Chinese entrepreneurs with Silicon Valley organizations. Sean Kuno is a research program manager at Microsoft Research Outreach. 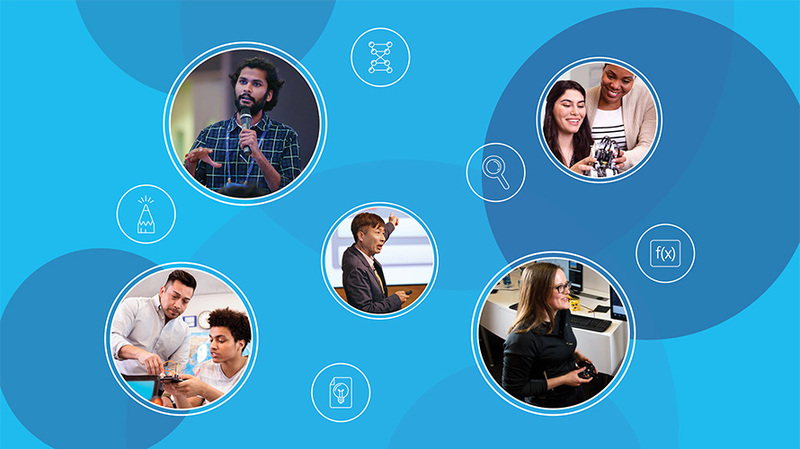 Kuno leads the ideation, design, and launch of community programs for AI projects such as Project Malmo; and works in partnership with universities and government agencies worldwide. Kuno joined Microsoft Research Asia in 2009 as a university relations manager. He leads the comprehensive academic research program, which encourages collaboration between Microsoft and the academic community in Japan. Before he joined Microsoft, he worked for the Japan Science and Technology Agency (JST), the second-largest funding agency in Japan. Before JST, he worked as a manager of marketing and product and business development in the cable and satellite industry in Japan. He received a BS and MS in quantum engineering and systems science from the Graduate School of Engineering, University of Tokyo. Jim Kurose is serving as Assistant Director at the National Science Foundation, where he has led the Directorate of Computer and Information Science and Engineering (CISE) since 2015. With an annual budget of more than $900 million, CISE’s mission is to support fundamental research in computer and information science and engineering, and transformative advances in cyberinfrastructure. Since April 2018, he has also been serving as Assistant Director for Artificial Intelligence in the Office of Science and Technology Policy. He has co-chaired the Networking and Information Technology Research and Development subcommittee of the National Science and Technology Council (NSTC), providing overall coordination for the activities of 17 government agencies. He has also co-chaired the NSTC’s subcommittees on Open Science, and on Machine Learning and AI. Kurose is a Distinguished University Professor, currently on leave, from the College of Information and Computer Sciences at the University of Massachusetts Amherst. He received his PhD in computer science from Columbia University, and a BA in physics from Wesleyan University. He has received a number of awards for his research and teaching, including the IEEE Infocom Achievement Award, the ACM SIGCOMM Award for Lifetime Achievement, and the IEEE Computer Society Taylor L. Booth Education Award. Along with Keith Ross, he is co-author of the textbook, Computer Networking, A Top-down Approach, now in its seventh edition. He is a Fellow of the ACM and the IEEE. Bruce Maggs received his BS, MS, and PhD degrees in computer science from the Massachusetts Institute of Technology. After spending one year as a postdoctoral associate at MIT, he worked as a research scientist at NEC Research Institute in Princeton. He then moved to Carnegie Mellon; later joining Duke University in 2009 as a professor in the Department of Computer Science. Maggs helped to launch Akamai Technologies, serving as its first Vice President for Research and Development, and retains a part-time role at Akamai as Vice President for Research. In 2017, he won the Best Dataset Award at the Passive and Active Measurement conference, the Best Paper Award at CoNEXT, a Distinguished Paper Award at USENIX Security, and the 2017 IEEE Cybersecurity Innovation Award for work that appeared at IEEE Security and Privacy. In 2018, he was part of a large team that received the inaugural SIGCOMM Networking Systems Award for the Akamai CDN. David A. Maltz leads Azure’s Physical Network team, which is responsible for developing, deploying, and operating the software and network devices that connect the servers of Microsoft’s largest services, including the Azure Public Cloud and Bing. His past projects include a broad array of hardware and software projects that strive to improve the usability, performance, and cost of cloud computing. Prior to joining Azure, he worked on the Microsoft Autopilot team, which won Microsoft’s 2013 Technology Achievement award for advances in cloud-scale datacenters. Prior to joining Autopilot, Maltz worked in industry research and academia, including five years at Microsoft Research. He founded two startup companies in network traffic management and wireless networking, and was part of the 4D team that won the SIGCOMM 2015 Test of Time award for the 2005 paper that spurred the field of Software Defined Networking, and part of the GroupLens team that won the 2010 ACM Software System Award. Vani Mandava is the Director of Data Science at Microsoft Research at Redmond. She has more than a decade of experience designing and shipping software that are in use by millions of users. She has an MS in computer science and a Bachelors in Computer Engineering from Pune University. She has enabled the adoption of data mining best practices in various products across Microsoft. She co-authored the book “Developing Solutions with Microsoft Infopath” and holds patents in service engineering. She leads Microsoft Research Outreach efforts at data science institutions in US universities. She co-chaired KDD Cup 2013 and partners with many academic and government agencies, including NSF-supported Big Data Innovation Hub consortia. She currently leads efforts for Microsoft Research Open Data Repository, a cloud-enabled dataset repository for hosting and sharing Microsoft Research datasets. Margaret Martonosi is the Hugh Trumbull Adams ’35 professor of computer science at Princeton University. She is also director of Princeton University’s Keller Center for Innovation in Engineering Education. Martonosi’s research interests are in computer architecture and mobile computing. Her work has included the development of the Wattch power modeling tool and the Princeton ZebraNet mobile sensor network project for the design and real-world deployment of zebra tracking collars in Kenya. Her current research focuses on hardware-software interface approaches to manage heterogeneous parallelism and system complexity in both classical and quantum computing architectures. Martonosi is a fellow of both IEEE and ACM. 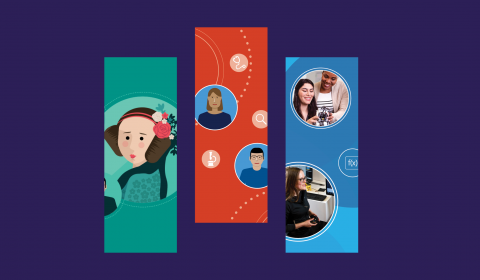 Notable awards include the 2018 IEEE Technical Achievement Award, the 2010 Princeton University Graduate Mentoring Award, and the 2013 Anita Borg Institute Technical Leadership award. Her research has earned numerous best paper awards, as well as long-term impact awards from ACM SIGARCH, ACM SIGMOBILE, ACM SenSys, and IEEE HPCA. Sambhrama Mundkur is a technical lead in Azure networking, working in the area of accelerated networking. At Microsoft, she has primarily worked on network offload technologies, especially in the areas of network virtualization, such as Virtual Machine Queue, Single-Root I/O Virtualization, and Generic Flow Table Offload. She has an MS in computer science from Purdue University and an undergraduate degree from Birla Institute of Technology & Science, Pilani (India). Brendan Murphy is a principal researcher at Microsoft Research-Cambridge UK. Murphy is an empirical researcher focusing on system reliability, software engineering, and continuous deployment. Recently, Murphy has been working closely with the product groups to characterize the total life cycle of continuous deployment processes with Microsoft. Murphy graduated from Newcastle University and has previously worked for ICL and Digital. Onur Mutlu is a professor of computer science at ETH Zürich. He is also a faculty member at Carnegie Mellon University, where he previously held the Dr. William D. and Nancy W. Strecker Early Career Professorship. His current broader research interests are in computer architecture, systems, and bioinformatics. He is especially interested in interactions across domains and between applications, system software, compilers, and microarchitecture, with a major current focus on memory and storage systems. He obtained his PhD and MS in ECE from the University of Texas at Austin, and BS degrees in computer engineering and psychology from the University of Michigan, Ann Arbor. His industrial experience spans starting the Computer Architecture Group at Microsoft Research, and holding various product and research positions at Intel Corporation, Advanced Micro Devices, VMware, and Google. He received the inaugural IEEE Computer Society Young Computer Architect Award, the inaugural Intel Early Career Faculty Honor Program Award, faculty partnership awards from various companies, a healthy number of best paper or “Top Pick” paper recognitions at various computer systems and architecture venues, and the ACM Fellows recognition. Ed Nightingale is the partner product architect for Azure Sphere at Microsoft. Nightingale’s role as architect spans writing core software for the product, authoring software and silicon requirements, and ensuring the end-to-end product meets customer needs. He has helped shape and grow the product from incubation to public announcement. Nightingale is also a systems researcher and software engineer. He has authored papers in top systems conferences such as OSDI and SOSP. He has co-authored 20 conference and journal publications, won six best paper awards, and even helped to set the world record in disk-to-disk sorting (http://sortbenchmark.org). He has also worked as an engineer and as an engineering manager running a large-scale distributed storage service. Aaron Ogus started at Microsoft in 1991 on a project that became Windows 95. He’s worked on DirectX and worked on the Forza Motorsport franchise in Microsoft Studios. Ogus has been working in Azure storage since 2008. He currently manages a team of about 100 engineers developing the lowest layers of the Azure storage stack, providing cost-effective durable storage for higher-level services. Ogus and his teams are involved in driving the evolution of storage software, and hardware in the industry to push the roadmap to more scalable and cost-effective storage systems, to enable acceleration of cloud computing and cloud storage growth. Andy Pavlo is an assistant professor of databaseology in the Computer Science Department at Carnegie Mellon University. He received a Sloan Research Fellowship in 2018 and the ACM SIGMOD Jim Gray Doctoral Dissertation award in 2014. Simon Peter works to dramatically improve data center efficiency and reliability by designing, building, and evaluating new alternatives for their hardware and software components. His work is supported by VMware, Microsoft Research, Huawei, Google, and ARM. He was twice awarded the Jay Lepreau Best Paper award. He received an NSF CAREER award and he is a Sloan Research Fellow. Peter is the director of the UT Austin Systems Research Consortium, where he collaborates closely with industry to shape the future of cloud computing. Peter is currently co-designing operating system networking and storage stacks with new hardware technologies to push server I/O efficiency an order of magnitude beyond today’s capabilities. He is also working on networking issues that arise when pushing performance far beyond current capabilities. Peter Pietzuch is a professor at Imperial College London, where he leads the Large-Scale Data & Systems group in the Department of Computing. His research focuses on the design and engineering of scalable, reliable, and secure large-scale software systems, with a particular interest in performance, data management, and security issues. He has published papers in premier international venues, including OSDI, USENIX ATC, EuroSys, SoCC, SIGMOD, VLDB, ICDCS, CCS, CoNEXT, NSDI, and Middleware. Before joining Imperial College London, he was a post-doctoral fellow at Harvard University. He holds PhD and MA degrees from the University of Cambridge. Dan Ports is a researcher in the Systems Research Group at Microsoft Research, Redmond. He leads the Prometheus project, which is exploring new applications for in-network computing and programmable datacenter hardware, with an eye towards dramatically improving the latency and throughput of cloud infrastructure services. Prior to joining Microsoft Research, he was on the faculty at the University of Washington, where he continues to advise students in distributed systems research. Before that, he received a PhD from MIT. Ports’ research spans distributed systems, operating systems, and networks, with a particular focus on building practical systems with strong theoretical underpinnings. His prior work demonstrated that co-designing network primitives with distributed systems design makes it possible to achieve strong guarantees for replicated systems and databases without the performance overhead. His research has been recognized with best paper awards at NSDI and OSDI. Balaji Prabhakar is a professor of electrical engineering and computer science at Stanford University. His research focuses on the design, analysis, and implementation of data networks; and he is interested in designing network algorithms, problems in ad hoc wireless networks, and designing incentive mechanisms. He received his PhD from University of California, Los Angeles. He has published more than 38 journal articles and his work has appeared in 60 conference proceedings. Umakishore Ramachandran received his PhD in computer science from the University of Wisconsin, Madison, and is on the faculty of Georgia Tech. His fields of interest include parallel and distributed systems, computer architecture, and operating systems. He is known for his work in Distributed Shared Memory (DSM), in the context of the Clouds operating system; and more recently for his work in stream-based distributed programming, in the context of the Stampede system. Currently, he is leading a project that deals with large-scale situation awareness that uses distributed camera networks and multi-modal sensing with applications to surveillance, connected vehicles, and transportation. Ramachandran has received numerous research and teaching awards and became an IEEE Fellow in 2004. Christopher Ré is an associate professor in the Computer Science Department at Stanford University. His work’s goal is to enable users and developers to build applications that more deeply understand and leverage data. His contributions span database theory, database systems, and machine learning; and his work has won best paper awards at PODS 2012, SIGMOD 2014, and ICML 2016. In addition, work from his group has been incorporated into major scientific and humanitarian efforts, including the IceCube neutrino detector, and PaleoDeepDive and Memex in the fight against human trafficking. He cofounded a company, based on his research, which was acquired by Apple in 2017, and has contributed to commercial products from major web and enterprise companies. He received a SIGMOD Jim Gray Doctoral Dissertation Award in 2010, a National Science Foundation CAREER Award in 2011, a Sloan Research Fellowship in 2013, a Moore Investigator Award in Data-Driven Discovery in 2014, the VLDB Early Career Researcher Award in 2015, a MacArthur Fellowship in 2015, and an Okawa Foundation Research Grant in 2016. Ant Rowstron is deputy lab director at Microsoft Research in Cambridge. He is currently focussing on new optical storage technologies and systems that will underpin future cloud storage. During his career, he has worked on distributed systems, networked systems, and most recently, storage systems. In 2016 he was awarded The Mark Weiser Award (ACM SIGOPS). He has been at Microsoft Research for 18 years, and prior to joining Microsoft he worked in both the computer laboratory and the laboratory for communications engineering at Cambridge University, while also consulting for Olivetti and Oracle Research Laboratory. He received a PhD in computer science and an MS in computer systems and software engineering, both from the University of York. Mark Russinovich is Chief Technology Officer for Microsoft Azure, Microsoft’s global enterprise-grade cloud platform. A widely recognized expert in distributed systems and operating systems, Russinovich earned a PhD in computer engineering from Carnegie Mellon University. He later co-founded Winternals Software, joining Microsoft in 2006 when the company was acquired. Today he remains the primary author of the Sysinternals tools and website, which include dozens of popular Windows administration and diagnostic utilities. Russinovich is a popular speaker at industry conferences such as IP Expo, Microsoft Ignite and Microsoft Build, and RSA Conference. He has also authored several nonfiction and fiction books, including the Microsoft Press Windows Internals book series, as well as fictional cybersecurity thrillers Zero Day, Trojan Horse, and Rogue Code. Arjmand Samuel is a principal program manager at Microsoft, working in the Windows Azure Internet of Things team. In his current role, Samuel is involved in the design and development of Windows Azure IoT Hub, a scalable framework for connecting, monitoring, and controlling millions of IoT assets. Previously, Samuel worked in Microsoft Research on IoT sensors and devices and was the security lead for Microsoft Windows Live. Samuel was faculty at the Ghulam Ishaq Khan Institute of Engineering Sciences and Technology, teaching computer science and engineering courses; and faculty at Center for Advanced Studies in Engineering. Samuel was co-founder of Evolving Technologies Corporation and a co-founder of Center for Information Technology and Development, Pakistan Aeronautical Complex. Currently, Samuel is a graduate faculty advisor at the Electrical and Computer Engineering Department, Purdue University. He also holds an affiliate faculty position at the University of Washington. Samuel has a BS in avionics engineering from NED University of Engineering and Technology; an MS in control engineering from Beijing University of Aeronautics and Astronautics; and a PhD in information security from Purdue University. He has published in a variety of publications on topics of security, privacy, location aware access control, and innovative use of mobile technology. Lucy Sanders is CEO and co-founder of the National Center for Women & Information Technology (NCWIT). Sanders has an extensive industry background, having worked in R&D and VP positions at AT&T Bell Labs, Lucent Bell Labs, and Avaya Labs for more than 20 years, where she specialized in systems-level software and solutions, including multi-media communication and customer relationship management. Sanders was awarded the Bell Labs Fellows Award, the highest technical accomplishment bestowed at the company; and she has six patents in the communications technology area. Sanders currently serves as a trustee for the Colorado School of Mines, the Center for American Entrepreneurship in Washington D.C., and the International Computer Science Institute at the University of California, Berkeley. She has served on the Information Technology Research and Development Ecosystem Commission for the National Academies, and the Innovation Advisory Board for the U.S. Department of Commerce. Stefan Saroiu is a senior researcher in the mobility and networking research group at Microsoft Research in Redmond. Saroiu’s research interests span mobile systems, computer security, and distributed systems. With his colleagues at Microsoft Research, he built and operated a cloud service with over 20 million users; and designed and built the reference implementation of a software-based Trusted Platform Module, which is used in many smartphones and tablets on the market today. Before joining Microsoft, Saroiu was an assistant professor at the University of Toronto; and a visiting researcher at Amazon.com, where he worked on the early designs of their new shopping cart system. Saroiu received his PhD from the University of Washington, where he was co-advised by Steve Gribble and Hank Levy. Siddhartha Sen is a researcher at Microsoft Research New York City and was previously a researcher at Microsoft Research Silicon Valley. He designs and builds distributed systems that use novel data structures and algorithms to deliver new functionality or unprecedented performance. Some of his data structures have been incorporated into undergraduate textbooks and curricula. Recently, he has used contextual machine learning to optimize decisions in a variety of settings, including Microsoft’s cloud infrastructure (check out our Decision Service). Sen received his BS degrees in computer science and mathematics, and his MEng degree in computer science from MIT; and his PhD from Princeton. Sen received the first Google Fellowship in Fault-Tolerant Computing in 2009, the best student paper award at PODC 2012, and the best paper award at ASPLOS 2017. For the most up-to-date information, please visit my personal website. Srinath Setty is a researcher at Microsoft Research. His research interests include systems, security, and privacy, in the context of cloud computing and datacenters. He has worked on untrusted storage systems, verifiable outsourced computation based on probabilistic and zero-knowledge proofs, unobservable communication, and media streaming, and formally verified distributed systems and security-critical cryptographic code. He got his PhD from UT Austin working on The Pepper Project, which ignited a new research area to refine and implement probabilistic proofs for verifiable outsourced computation. Muthian Sivathanu is a principal researcher at Microsoft Research India working on systems. His interests lie broadly in the space of large-scale distributed systems, operating systems, storage, and systems for deep learning and information retrieval/search. Prior to joining Microsoft Research, he worked at Google for 10 years, with a large part of the work focused on building key infrastructure powering Google web search—in particular, the query engine for web search. Sivathanu obtained his PhD from the University of Wisconsin-Madison in the area of file and storage systems, and a BE from College of Engineering, Guindy, Anna University. Virginia Smith is an assistant professor in electrical and computer engineering at Carnegie Mellon University, and an affiliated faculty member in the machine learning department in the School of Computer Science. Her research interests lie at the intersection of machine learning, optimization, and computer systems. A unifying theme of her research is to develop machine learning methods and theory that effectively leverage prior knowledge and account for practical constraints (e.g., hardware capabilities, network capacity, statistical structure). Specific topics include: large-scale machine learning, distributed optimization, resource-constrained learning, multi-task learning, transfer learning, and data augmentation. Dawn Song is a professor in the department of electrical engineering and computer science at UC Berkeley. Her research interest lies in deep learning, security, and blockchain. She has studied diverse security and privacy issues in computer systems and networks, including areas ranging from software security, networking security, distributed systems security, applied cryptography, blockchain, and smart contracts, to the intersection of machine learning and security. She is the recipient of various awards including the MacArthur Fellowship, the Guggenheim Fellowship, the NSF CAREER award, the Sloan Research Fellowship, the MIT Technology Review TR35 award, the Faculty Research awards from IBM, Google, and other major tech companies, and Best Paper awards from top conferences in computer security and deep learning. She is ranked the most-cited scholar in computer security (AMiner Most Influential Scholar award). She obtained her PhD from UC Berkeley. Prior to joining the faculty of UC Berkeley, she was on the faculty at Carnegie Mellon University. Nikhil Swamy is a senior researcher in the RiSE group at Microsoft Research Redmond. His work covers topics including type systems, program logics, functional programming, program verification, and interactive theorem proving. He uses these techniques to build provably correct and secure programs, including web applications, web browsers, crypto protocol implementations, and low-level systems code. Many of Swamy’s current projects connect to F*, a programming language and verification tool for higher-order, effectful programs. F* is the main programming language used in the Everest expedition, a project that aims to build and deploy a verified, drop-in replacement of the HTTPS stack, a lynchpin of internet security. Steven Swanson is a professor in the department of computer science and engineering at the University of California, San Diego and is the director of the Non-Volatile Systems Laboratory. His research interests include the systems, architecture, security, and reliability issues surrounding non-volatile, solid-state memories. He also co-leads projects to develop low-power coprocessors for irregular applications and to devise software techniques for using multiple processors to speed up single-threaded computations. He received his PhD from the University of Washington and his undergraduate degree from the University of Puget Sound. Vivienne Sze is an associate professor at MIT in the electrical engineering and computer science department. Her research interests include energy-aware signal processing algorithms, and low-power circuit and system design for portable multimedia applications, including computer vision, deep learning, autonomous navigation, and video coding. Prior to joining MIT, she was a member of technical staff in the R&D Center at Texas Instruments (TI), where she designed low-power algorithms and architectures for video coding. She also represented TI in the JCT-VC committee during the development of High Efficiency Video Coding (HEVC), which received a Primetime Emmy Engineering Award. She is a co-editor of the book High Efficiency Video Coding (HEVC): Algorithms and Architectures. Sze is a recipient or co-recipient of the 2011 Jin-Au Kong Award for Outstanding PhD Thesis in Electrical Engineering at MIT, the 2017 CICC Outstanding Invited Paper award, the 2017 Qualcomm Faculty Award, the 2016 IEEE Micro Top Picks award, the 2016 Google Faculty Research Award, the 2016 AFOSR Young Investigator Award, the 2016 3M Non-Tenured Faculty Award, the 2014 DARPA Young Faculty Award, the 2008 A-SSCC Outstanding Design Award, and the 2007 DAC/ISSCC Student Design Contest award. Matthias Troyer is a principal researcher in the Quantum Group of Microsoft. After receiving his PhD in 1994 from ETH Zürich, he spent time as postdoc at the University of Tokyo before returning to ETH Zürich. There he has been professor of computational physics until taking leave of absence to join Microsoft’s quantum computing program at the beginning of 2017. Troyer is a fellow of the American Physical Society, a trustee of the Aspen Center for Physics, and recipient of the Aneesur Rahman Prize for Computational Physics of The American Physical Society. His research interests span from high-performance computing and library design for scientific computing to the simulations of quantum devices and island ecosystems. At Microsoft, he now works on various aspects of quantum computing, from numerical modeling of quantum hardware to discovering new applications for quantum computers. Keith Winstein is an assistant professor of computer science at Stanford University. His research group designs networked systems that cross traditional abstraction boundaries, using statistical and functional techniques. He and his colleagues made the Mosh (mobile shell) tool, the Sprout and Remy systems for computer-generated congestion control, the Mahimahi network emulator, the Lepton JPEG-recompression tool, the ExCamera system for parallel video processing on cloud functions, the Guardian Agent for secure delegation across a network, the Salsify real-time video system, and the Pantheon of Congestion Control. Winstein previously served as a staff reporter at The Wall Street Journal and later worked at Ksplice, Inc., a startup company (now part of Oracle Corp.) where he was the Vice President of Product Management and Business Development. Winstein did his undergraduate and graduate work at MIT. Laurie Williams is the interim department head of computer science and a professor in the computer science department at North Carolina State University (NCSU). Williams is a co-director of the NCSU Science of Security Lablet. Williams’ research focuses on software security, agile/continuous deployment software development practices and processes, software reliability, and software testing and analysis. Williams received her PhD from the University of Utah, her MBA from Duke University, and her BS in industrial engineering from Lehigh University. Williams is an IEEE Fellow. Ming Wu is a senior researcher from Microsoft Research Asia. He joined Microsoft in 2007 after getting his PhD from Institute of Computing Technology, Chinese Academy of Sciences. His research interests include distributed transaction processing, graph processing, and machine learning platforms. He has published many papers in top conference in the system area, including SOSP, OSDI, NSDI, ATC, EuroSys, SoCC, and VLDB. Wu has served on committees for OSDI, ASPLOS, HotDep, Middleware, and more, and was publication chair for SOSP ’17. Jilong Xue is a researcher in the System Research Group of Microsoft Research Asia. His research focuses on building large-scale computing systems for resource-intensive workloads such as machine learning and deep learning, through leveraging modern hardware such as graphics processing units. He is working on optimizing deep learning frameworks to bridge AI applications and heterogeneous hardware, as well as building the next generation of systems for future AI workloads. Xue received his PhD in computer science from Peking University. Previously, he has worked on large-scale graphics processing systems, social networks security, and streaming systems. Fan Yang is a researcher at the systems research group of Microsoft Research Asia. His research focuses on large-scale distributed systems. Yang is currently driving the open source effort on Open AI platform (OpenPAI). In the past, he has designed and developed several graph engines, including GraM, an in-memory graph engine that supports trillion-scale graph computations. He also rearchitected the Bing Ads Platform team’s MSM pipeline, improving the performance and revenues by 50 percent. Yang received his PhD in computer science from Nanjing University. Matei Zaharia is an assistant professor of computer science at Stanford and Chief Technologist and co-founder of Databricks. He has worked broadly in computer systems for data processing and machine learning. During his PhD at UC Berkeley, Zaharia started the Spark computing engine, which became Apache Spark, and co-started the Apache Mesos cluster manager, as well as other open source software for large-scale data analytics, genomics, and machine learning. At Stanford, Zaharia is a principal investigator in the DAWN project, focusing on infrastructure for usable machine learning. Zaharia’s research was recognized through the 2014 ACM Doctoral Dissertation Award, the VMware Systems Research Award, and an NSF CAREER award. Lin Zhong is professor of electrical and computer engineering with Rice University. He received his BS and MS from Tsinghua University and PhD. from Princeton University. At Rice, he leads the Efficient Computing Group to make computing, communication, and interfacing more efficient and effective. He and his students received the best paper awards from ACM MobileHCI, IEEE PerCom, ACM MobiSys (3), and ACM ASPLOS. He is a recipient of the NSF CAREER Award, the Duncan Award from Rice University, and the RockStar Award from ACM SIGMOBILE. More information about his research can be found at http://www.recg.org. Microsoft’s AI for Earth program was created to fundamentally change the way that society monitors, models, and ultimately manages Earth’s natural resources. Computer vision algorithms provide major advances towards that ambition, allowing the detection and classification of thousands of species from photos and videos. Integrating these algorithms into popular applications allows everyone, from professional scientists to casual hobbyists, to contribute to a massively growing portfolio of biodiversity observations, at a planetary scale. Azure Confidential Computing (ACC) provides strong security and privacy guarantees: customers can upload encrypted code and data, and then receive encrypted results with the guarantee that no one can see the customers’ secrets. This guarantee holds even in the presence of malicious insiders with administrative privileges or malware that exploits bugs in the operating system or the hypervisor. Our research in this space ranges from designing hardware-based isolation technology for code and data, to refactoring existing services to make use of these hardware capabilities and creating new services. We will demonstrate our work on confidential AI, including multi-party machine learning and confidential consortium-based blockchains, which provide strong privacy guarantees, high throughput, and low latency. Current blockchains feature low performance, allow everyone to see the full history of transactions, and do not provide a means to evolve their governance rules. COCO uses a permissioned consortium model and trusted hardware modules to address these limitations. It achieves high throughput (100x larger than currently deployed blockchains) and full confidentiality of data, chaincode, and transaction history. This project proposes a combination of new secure hardware for acceleration of machine learning (including custom silicon and GPUs), and cryptographic techniques to limit or eliminate information leakage in multi-party AI scenarios. This project is designed to address the privacy and security risks inherent in sharing data sets in the sensitive financial, healthcare, and public sectors. When realized, quantum computing will make a giant leap forward from today’s technology—one that will forever alter our economic, industrial, academic, and societal landscapes. This has massive implications for all industries, including healthcare, energy, environmental systems, smart materials, and more. Microsoft is taking a unique revolutionary approach to quantum computing and offers a way to get started developing quantum solutions with its Q# and Quantum Development Kit. FaRM is an in-memory transactional object store for random-access latency-sensitive workloads, such as graphs and key-value stores. It provides high throughput and low microsecond latency by using remote direct memory access (RDMA) and novel transactional protocols. In addition to presenting FaRM, we have built A1, a graph store built on top of FaRM, and which is being adopted as the next generation graph platform targeting several scenarios in Bing, Office, and Cortana. Data-driven techniques help boost agricultural productivity by increasing yields, reducing losses and cutting down input costs. However, these techniques have seen sparse adoption owing to high costs of manual data collection and limited connectivity solutions. Our solution, called FarmBeats, is an end-to-end IoT platform for agriculture that enables seamless data collection from various sensors, cameras, and drones. Our system design explicitly accounts for weather-related power and Internet outages, and has been enabled in six-month-long deployments at two US farms. We propose a platform to validate networks with high-fidelity emulations. On a computing cluster such as Azure, we run the full stack (including real operating system, software, and chip emulators) of each network device in a virtualized sandbox (a virtual machine or a container). We interconnect the sandboxes of the network devices with virtual network links in the same way as in production and load real configurations onto them. The network operator can directly log into emulated devices and carry out tests, or we can extract the routing information and analyze it logically by using a logic solver such as Z3. The key advantage is high fidelity: it directly verifies the network status and behaviors with the same software and configurations as in production, so that it can produce much more trustworthy validation results to network developers. We have shown an early prototype to Azure network engineers, to enthusiastic response. Developing and testing real-world AI is an expensive and time-consuming process. We need to collect a large amount of annotated training data in a variety of conditions and environments, and such data-driven systems can result in failure cases that can jeopardize safety. In this session, we will explore how high-fidelity simulations can help us alleviate some of these problems. We will discuss how near-realistic simulations can help not only with gathering training data, but also can be embedded in imitation-learning or reinforcement learning loops to improve sample complexity. Our discussion will center around AirSim, an open-source simulator built on Unreal Engine that offers physically and visually realistic simulations. Open platform for AI (Open PAI) is an open-source platform for GPU cluster management and resource scheduling. PAI provides runtime environment support, GPU scheduling, and supports debugging, log collection, and port management. PAI is designed to significantly lower the operation overhead on a GPU cluster and improve the productivity of AI researchers. PAI embraces a microservices architecture: every component runs in a container and exposes an explicit service endpoint to other components. The flexibility and modular design of PAI make it an attractive platform to evaluate various research ideas. A reliable, performant, and low-cost network is a critical part of the cloud infrastructure. Our research aims to re-invent the next-generation network via emerging optical technologies. This is challenging yet timely because network capacity and speed requirements are expected to increase at the same time as prevalent network technologies become hard to scale. We will demonstrate new low-power and low-cost transceivers developed at Microsoft that are currently being deployed in our data centers, and ongoing research towards new switching systems and network architectures that could, in the future, enable new cloud applications and scenarios. We demonstrate Platform for Situated Intelligence, an open-source, extensible framework that enables the development, fielding, and study of situated, integrative-AI systems. The framework aims to address the challenges of developing multimodal, integrative systems that harness multiple AI technologies, and provides a basis for studying AI techniques for automatic tuning and optimization in such systems. Microsoft has established itself as a pioneer in trustworthy computing. Features such as Always Encrypted in SQL Server show how we continue to keep trust while making world-class products. We imagine a world where user privacy is preserved by using state-of-the-art cryptography while enabling better AI and data analytics products. In this talk, we will discuss how homomorphic encryption, a new encryption technology, is making all this possible. We will also show how this technology is being built into existing data analytics/ML/AI frameworks. The goal of Project Fiddle is to build systems infrastructure to systematically speed-up distributed deep neural network (DNN) training while eking out the most from the resources used. Specifically, we are aiming for 100x more efficient training. To achieve this goal, we take a broad view of training: from a single GPU, to multiple GPUs on a machine, all the way to multiple machines in a cluster. Our innovations cut across the systems stack from the memory subsystem, to structuring parallel computation, and interconnects between GPUs and machines. Our work has generated interest and led to collaborations with product groups such as Cognitive Toolkit and Cloud Server Infrastructure. We present a prototype of time-of-flight depth-sensing technology, which will be adopted in Project Kinect for Azure as well as in the next-generation of HoloLens. This depth sensor outperforms the current state-of-the-art in terms of depth precision, while maintaining both a small-form factor and high-power efficiency. The depth sensor supports various depth ranges, frame rates, and image resolutions. The user can choose between large and medium field-of-view modes. Our depth technology is used for real-time interaction scenarios such as hand or skeleton tracking and enables high-fidelity spatial mapping. It also empowers researchers and developers to build new scenarios for working with ambient intelligence using Azure AI. The modern datacenter fabric increasingly includes programmable devices capable of increasingly sophisticated processing – ranging from programmable switches that support in-network computation to network-attached FPGAs and smart storage devices. This project asks how we can leverage this new capability to build a new generation of storage and data processing systems that achieve dramatically better performance, reliability, and efficiency. The key idea is to co-design distributed systems with the data center hardware: introducing new low-level primitives and building systems around them. We have already used this approach to achieve order-of-magnitude speedups for replicated services and transaction coordination. Future directions include: a scalable analytics system that handles massive volumes of network telemetry data by moving the first-level filtering and aggregation to programmable network devices; in-network aggregation for faster training of deep neural networks; and replicated remote storage with minimal CPU overhead by using network-attached programmable solid-state drives. We demonstrate a robot to assist (not replace) a human receptionist. Our design philosophy is based on Reddy’s 90 percent AI principle for human and robot cooperation: 90 percent of routine tasks are handled by a robot, with the remaining 10 percent of exceptional tasks are handled by a human. The receptionist is the leader and the robot is a follower; the robot works only under the orders of the leader. Using this principle, we have designed and implemented functionalities for this assistant robot, such as a knowledge engine to augment the receptionist’s ability to answer questions, a situation engine to provide awareness of the receptionist’s needs, and a conversation engine for verbal interaction with the receptionist and customers. This project is exploring ways to create intelligent and efficient cloud platforms by leveraging machine learning (ML) techniques. Our first foray in this direction has produced Resource Central (RC), an ML and prediction-serving system that provides intelligence to the various resource managers in a cloud platform. Specifically, RC collects telemetry from virtual machines and servers, learns from their prior behaviors and, when requested, produces predictions of their future behaviors. RC is currently in production within the Azure Compute Fabric. Our ongoing research effort is exploring other architectures and approaches to integrating ML into cloud systems. In particular, we are currently investigating how to broaden the set of management tasks that RC can support. Our poster will highlight our vision for intelligent and efficient cloud platforms, describe potential approaches for integrating ML, and provide an overview of RC and its initial results. The industry largely underestimates the societal need to embody the highest levels of security in every network-connected device—every child’s toy, every household’s appliances, and every company’s equipment. High development and maintenance costs have limited the application of strong security to high-cost or high-margin devices. We present research about bringing high-value security to low-cost devices. We are especially concerned with the tens of billions of devices powered by microcontrollers; a class of devices ill-prepared for the security challenges of internet connectivity. We will outline the seven properties required in all highly secure devices and describe our experiments to translate these properties for microcontroller-based devices. 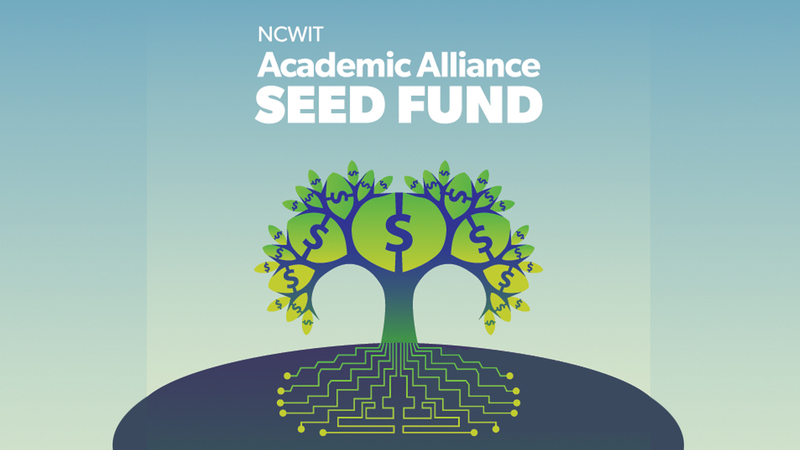 The NCWIT Academic Alliance Seed Fund sponsored by Microsoft Research awards NCWIT Academic Alliance (AA) members at non-profit, U.S. institutions with start-up funds (up to $10,000 per project) to develop and implement initiatives for recruiting or retaining women in computing and IT. 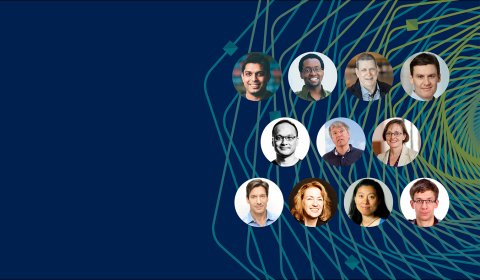 The Microsoft Research Faculty Fellowship recognizes innovative, promising new faculty members, whose exceptional talent for research and innovation identifies them as emerging leaders in their fields. Learn more and nominate a candidate.